Building and planning your arena base is the bedrock of any quality riding experience. You need to create a firm yet supportive base for your footing. This is the first step in building a proper base. With your digging implement of choice (backhoe, excavator, skid-steer, bulldozer) you will dig down to a soil layer that is naturally compacted (virgin) and at least below the top soil layer. Have all the base and footing layers in mind when planning for the ultimate finish height of the footing plus the sub-base. Generally, the box out depth is a minimum of 6 inches to allow for aggregate, stone dust, and footing layers. It is highly recommended you consult a local excavating contractor for the proper depth needed in your specific area. Some sub-soils must be excavated to greater depths due to unstable conditions. For outdoor settings you will also need to make a slight crown in the arena, or create a 1-2% slope, with the center of the arena being the highest point. This will allow the natural flow of water to travel towards the side drains (see section on drainage) and not create pooling in your arena. The crown of the arena should be created at the sub-base layers not simply created by the top layer of footing. After a crown has been created, the sub-base needs to be compacted by using a 10-ton roller. When this step has been completed you will be left with a “box” that the subsequent aggregate, stone dust and footing will then fill. The first actual layer of your base is called your aggregate stone layer. The layer will go directly on top of your sub-base and will be between 2-3 inches deep (again always depending on local conditions). This layer will be composed of clean aggregate stones that are anywhere from 1/4″x 1/8” to 1/2” x 1”. 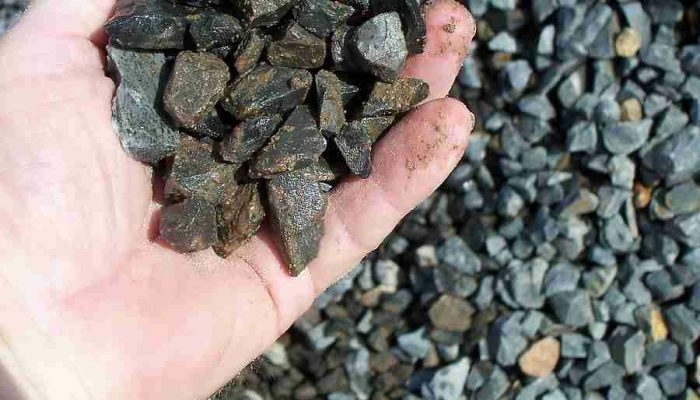 It is important to make sure that “sub-angular” stones that can have fines as well which are used in this layer, not rounded gravel or pea gravel. This should not be an unusual request from you local stone quarry, though many different names are used depending on which part of the country your new arena is being constructed. Make sure to check the specification sheet before ordering. Again, in an outdoor setting this layer will also be installed to follow the 1-2% crown from the center of the arena and rolled with a 10-ton roller. Between your aggregate stone layer and your crushed stone dust layer, you will need a layer of geotextile fabric or landscape fabric. The fabric creates a water porous barrier between the large stone layer and the compacted stone dust layer. Placing the fabric between the two layers allows water through, but blocks the large aggregate stones from moving upward into the compacted stone dust layer and potentially contaminating your footing. Above the geotextile fabric you will install a compacted stone dust layer. This will be made up of the fines from most stone crushing operations. It is not crusher run or driveway base material, it possesses only fines. This stone dust is then compacted down with a roller using water. It is important that this layer is given the proper attention and time to be fully compacted. By rolling and compacting this layer, it will construct a solid even base for your footing to be placed. The compacted stone dust layer should be between 2-3 inches deep. Nothing besides a compacted stone layer should be below your footing. A clay layer below your footing will not create the necessary stability for the footing above and also runs the risk of integrating into your arena surface. Even though you may compact the clay during installation, eventually with use over time the surface will break the clay apart causing an unstable surface and small dust particles in your footing. A range of machinery will be needed to construct the base. An excavator will be used to dig down to the correct sub soil material. Your contractor might also bring in a bulldozer for more rapid earth moving. A roller will be used on multiple layers: sub-base, aggregate, stone dust, final footing. The roller should be between 10-15 tons. A skid-steer will be used during the process of the footing installation and possibly during part of the base construction. At laser level is essential. Do not try to level your arena base by eye. This indispensable tool is easily rented from your local equipment rental outlet and is the only way to ensure an accurate installation. Patience and diligence in getting the correct grading is essential to a quality arena. If properly executed your base will perform for many years to come, keeping your arena dry and your riding surface even and predictable. Take your time, plan, and double check. Most outdoor arenas will have drainage parallel to each side of the arena, roughly a foot outside of the arena fencing and buried six inches deep. The drains in this location on an arena or a house are called “curtain drains” or “French drains” which will be 4-6 inch perforated pipe. The perforated pipe will drain water from both your arena and from infiltrating ground water. Being sure to have a proper plan for ground water infiltration can make for a much dryer arena even in parts of the country that have very high water tables. To this point these recommendations also cover drainage around an indoor or covered arena. Even though rain may not be falling on your arena directly a plan must be in place for runoff from the roof and groundwater infiltration. The outside of the arena should also have more aggregate stone at the depth of your subbase. With your footing and base having a slight crown the water will flow downhill toward the curtain drains and not sty sitting on top of your arena. The indoor and outdoor bases vary for obvious reasons. For an indoor arena there is less of a concern needed for drainage, so there does not need to be drains around the arena. Though, drainage will be essential for around the barn structure and if ground water infiltration is a concern step should be taken to mitigate the risk. Generally for an indoor the base layers can also be less robust. Both the aggregate and stone dust layers may only need to be 1-2” each for an indoor as opposed to 2-3” for an outdoor. This will save on the base layers a great deal when constructing an indoor arena. It’s difficult to locate well-informed folks on this topic, but you seem like you understand what you’re talking about!